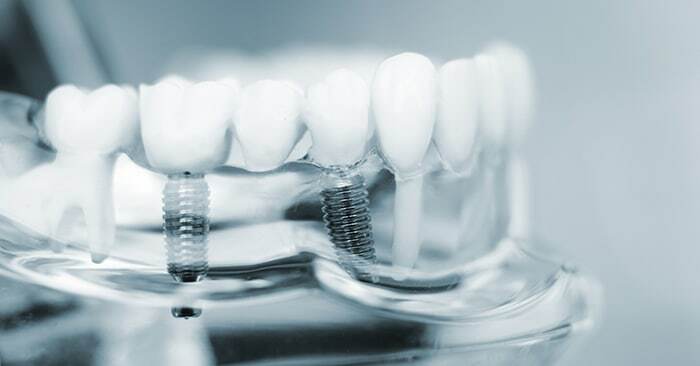 Dental implants are used for people who are missing either a single tooth or multiple teeth and want to restore the appearance of their smile and improve their ability to bite and chew food. All-on-4 dental implants are an advanced technique that requires the insertion of four implants in the upper or lower jaw to support a group of teeth that are fixed securely to these very stable implants. This is a system that has proven its functionality over time, offering a very effective alternative to dentures and bridges. For implant surgery, your mouth should be generally healthy and there should not be any gum disease. If implants are fitted where there is gum disease, it is possible that there will be an infection that could lead to the failure of the procedure. Your dentist will check that your oral health is suitable for a procedure. If you meet the criteria for implant surgery then the most suitable treatment must be identified taking into consideration factors, such as general health, the number of missing teeth, the location of where they are missing in your mouth, the amount of bone at the site, the quality and integrity of that bone, and if you have any specific health conditions that might impact on your recovery. After the implants have been inserted, there will be regular check-up appointments to assess the condition of your mouth around the implants and to take any steps needed to prevent any complications or to treat any signs of infection. This system provides many benefits. You are able to have new teeth firmly in place quickly. You will have a completely new and attractive smile as a result of the procedure. If you have had problems with your old teeth or dentures, then you will find eating is considerably easier. They are very stable and give you a firm bite so you can eat with confidence, even enjoying foods that you could not eat because of your teeth problems. Implants are secured to your jaw bone so they will not change position. You can be confident your smile will be secure. The titanium used for the implants will last more than a lifetime and the quality materials used to construct your new teeth will look good for many years. They are also easy to replace when it becomes necessary. Because of their stability and the materials used for constructing the new teeth, it is easy to maintain your new smile. You will still need to have regular check-ups just to confirm there are no problems and that your daily dental care routine is working. By replacing any failing teeth and reducing the chance of associated problems such as gum disease, you are removing a range of health issues that can impact you. A clean and healthy mouth and a confident smile will provide multiple benefits to your well-being. This is an efficient system where you are able to replace multiple teeth by only using four implants, which reduces the costs to you as well. The surgery is reasonably straightforward and the titanium implants will create a structure as strong as that of natural teeth. Often the surgery is able to be completed in one session. We will check to see if bone grafts are required as part of our preparation work for this procedure. With this type of procedure, we will always ensure that you are kept fully informed of each part of the process. We understand that this is an important step for you and we want to make sure you feel supported and also have all the information you need to confirm you are making the right choice. There have been ongoing improvements in the methods and the materials used for the construction of crowns and bridges for replacing your old teeth. It is now possible to choose a material that will very closely match the colour of your natural teeth. These are carefully shaped so that is very difficult to identify that they are not part of your natural smile. We provide the high quality but more expensive porcelain materials that provide stronger and longer lasting results. We also offer cheaper options that use composite materials that are very functional and still match the appearance of your natural teeth. We are confident that you will be able to find a suitable material to provide an effective solution that will match your specifications. These teeth are much more comfortable than dentures. Sitting on a very stable metal base, they stay completely still while you are speaking or eating, just the same as ordinary teeth. You will not experience any embarrassing situations such as dentures coming loose. There is also no possibility of the discomfort that occurs with having dentures, as they can rubb the inside of your mouth or cause gum soreness. This technique has been in use for decades and is recognised internationally as a safe treatment. Clinical studies have confirmed the effectiveness and the safety of dental implants and the All-on-4 system is a well recognised and successful process used extensively. At Sunshine Dental Group, we provide a range of options to assist you with making payments for this type of procedure. We have tried to ensure that we provide flexibility with multiple options available. We are able to process EFTPOS transactions, as well as debit and credit cards such as Mastercard and Visa. For many people, if their health insurance covers the procedure, we are able to process on the spot claims with all health providers. This means that you will only have to pay the difference for your procedure. We understand that for many of our patients dental care can be expensive, especially with more advanced cosmetic dentistry procedures. Because of this, we have put in place arrangements for our clients to be able to use payment plans or credit options. Denticare is a Direct Debit Payment Plan that enables you to spread out the payments for your dental procedure over a set period of time. The system is fully automated with direct debit payments made regularly from your bank account or credit card. This payment plan has been designed to be managed with a minimum of hassle for you while still offering you security and confidence in the process. It even offers you the flexibility to change the arrangements during the term of the payment plan arrangements. The benefits of using this arrangement are that you will not have to make interest payments. To set up the arrangement it is necessary to be able to make an initial payment of 25% of the fee directly to Sunshine Dental Group. The balance of your payment will then be arranged through the Denticare Payment Plan. We have selected this system as the application process is straightforward for you. You simply need to fill in a one-page Direct Debit Request form. There is no credit contract and it offers the options of using your bank account for the payments or you can have regular payments from your credit card if that suits you better. The payment plan offers flexible terms for making the payment of the remaining amount up to six months. You are able to select to make the payments either weekly, fortnightly, or monthly, depending on what will fit in with your personal financial arrangements the best. There are some additional conditions that apply when making the arrangement and you are able to contact us to find out more details and confirm your eligibility. We have also put in place the option for our patients to use the financing option available through Mac Credit. They offer payment plans that have been designed to assist clients who require dental procedures. There are a range of options available with payment plans that can cover up to $70,000. The whole process is managed by Mac Credit consultants who value your privacy. They offer payment terms up to seven years and they offer flexible payment options. Any additional payments or rebates available through Medicare or private health insurance can be added back to the payment plan at no extra charge. They offer an efficient application and assessment process with applications able to be made online. You are able to call them to speak with their staff to find out more. Alternatively, you can visit their website to find out the features of these payment plans. If you decide to use this option, then it is necessary for the approval of your application, as well as your agreement to their terms and conditions, to be finalised prior to the treatment commencing. If you contact Mac Credit they are able to provide you with a formal quote based on your circumstances and provide you with information about the terms and conditions. It is important that you undertake a full credit and financial assessment prior to accepting any offer or product. Contact Sunshine Dental Group by calling (03) 9311 1056 today to find out how we can help you achieve a new safe and attractive smile.